Dundee is only slightly out of the way when it comes to traveling. The airport offers a flight to London and a couple of remote Scottish airports on private planes. However, Edinburgh airport hosts tons of destinations with very competitive prices. Having got return tickets to Milan for £45.00 and Madrid for £75, it’s too cheap not to travel! You can travel from Dundee to Edinburgh airport via train, bus or a taxi service. The bus is the cheapest but takes stage longest so I’d only advise this if you have a mid-day/evening flight and you have time to kill. The train is my preference and can be the cheapest with a Railcard! 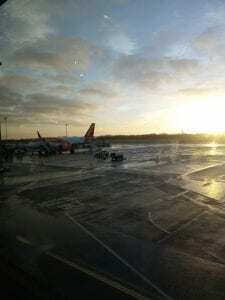 However if your flight is the first thing you will need to wait in the airport after getting the final flight, a trailing task I have undertaken several times. Dundee Direct is a University taxi service that matches you up with other travelers to get you a trip for at minimum £21.00. Slightly more expensive but nothing on the cost of coffee trying to stay awake in the departure lounge at 3am. 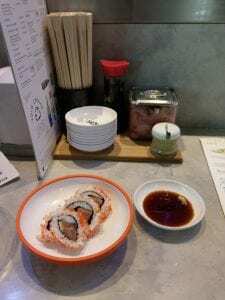 My favorite thing about Edinburgh Airport is Yo-Yo Sushi, nowadays I need to calculate the price into my flight cost! With a student card, you can get 20% off Tuesday’s to Fridays if you signed up online. A deal I highly recommend. You can also grab a bargain in the Duty-free alcohol and tech shops if you are looking, often it can be cheaper but I’d definitely check my prices versus the high street. When you get to your destination you can claim 10% of Hotels.com with uni days or use your Clubcard points! 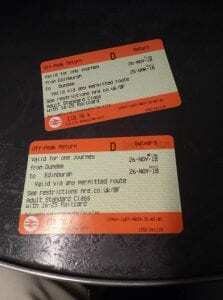 The first time I took the train and the tram from Dundee to Edinburgh Airport I was surprised how easy it was. £75 for Madrid – nice!